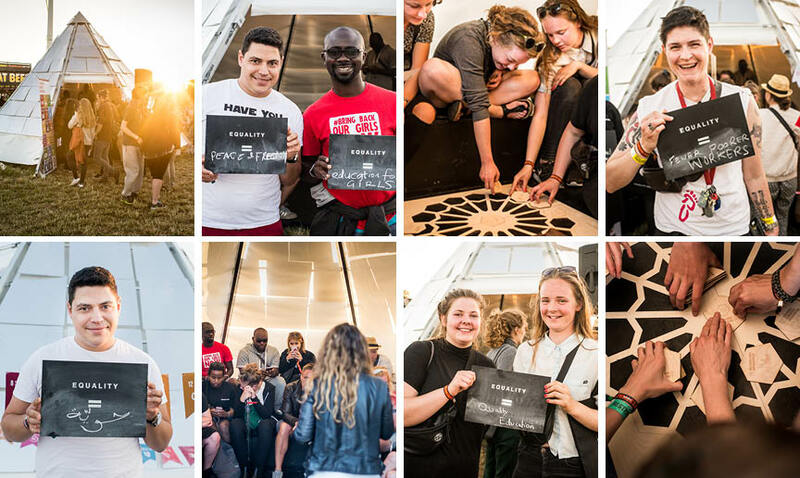 World’s Best News has partnered with Roskilde Festival for many years – and since 2015 we have been Equality partners. In this special partnership running from 2016 to 2018, we focus on the common theme of Equality together with other selected organizations. The partnerships will result in numerous debates, art, workshops, music, and talks. We believe music and art can change the world. Changing a community is something we can only do together. We believe a festival can promote a movement of young people who want more than just themselves and their closest friends. Through Global Goals Bingo on the festival field we talked about the Global Goals with the festival guests as a part of the festival program ‘Equality’. Especially issues about economical equality and inequality across the 17 goals was highlighted. As the finals following 3 days of Global Goals Bingo the festival guests were gathered for a second round of ‘World’s Best Quiz’, where the radio host Sara Bro guided us safely through the ‘Never Have I Ever’-round and ‘The World Is Doing Better Than We Think’-round. Based on world-wide news about gender equality, we made an interactive quiz in 2017 focusing on Goal 5: Gender Equality. We wished to discover if gender discrimination is something the guests on Roskilde Festival experience in their everyday life, and if they even notice the discrimination? As a follow up to that, we looked out to the world, and quizzed about gender equality on a global level. Equality Equals focused on Global Goal no. 10: Reduced Inequalities. Through a dialogue board game, we showed how this goal is central to the other 16 goals – and that there are already good news to find on the topic. What does equality mean at global level? What does equality mean to you? What can you do in your daily life to contribute to Goal 10? With #LittleBigThings we wanted to translate the Global Goals to personal engagement and everyday actions. Changes start with ourselves – and with the little things that may grow big when many begin to practice them. Therefore, the task was to commit to a goal and seal the promise with a stamp. Which goal do you choose – and what will you do to contribute to it? The Little Big Things project was supported by The European Year for Development.